Tibetan Areas Rocked By Protest, Chinese Crackdown Chinese forces opened fire on Tibetan protesters this week, killing up to four and wounding more than 30, say Tibetan rights groups. The protests are among the largest against Chinese rule in nearly four years and were inspired in part by a disturbing trend: Tibetans setting themselves on fire. 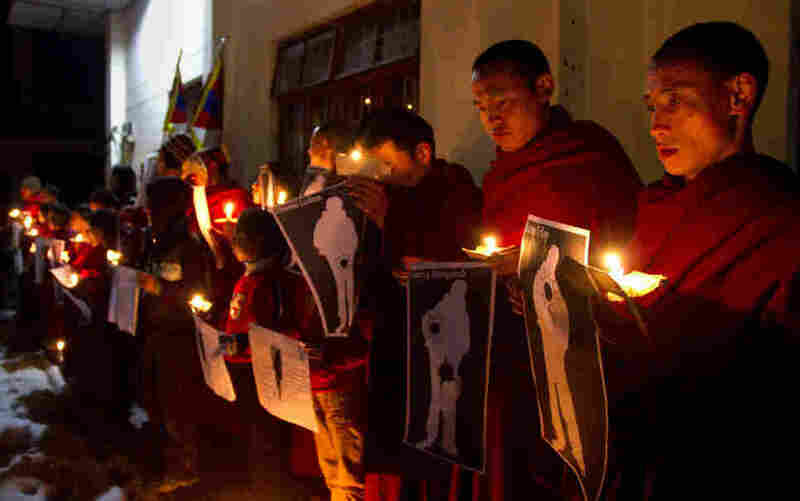 During a candlelight vigil in Dharamsala, India, on Wednesday, Tibetan Buddhist monks hold pictures of Tibetans they say were shot by Chinese security forces earlier this week. Frustrated Tibetans this week staged some of the largest protests against Chinese rule in nearly four years. Chinese security forces responded by opening fire on demonstrators, killing up to four and wounding more than 30, according to Tibetan rights groups. The demonstrations were inspired — in part — by a disturbing new trend in Tibetan dissent: Tibetan people lighting themselves on fire. By most accounts, this week's violence began with leaflets that were distributed in a Tibetan region of China's far-western Sichuan province. At least one leaflet urged people to protest Chinese rule by not celebrating Chinese New Year, which began Monday. The leaflet also contained something certain to stir strong feelings. Ethnic Tibetan monks (left) walk past police vehicles on a street in Chengdu in China's Sichuan province Thursday. The Tibetan-inhabited region of West Sichuan appeared to be under lockdown after recent clashes. "An unknown Tibetan author was saying he or she was preparing to set fire to themselves," says Kate Saunders, who works with the International Campaign for Tibet in London. Since last March, 16 Tibetans have doused themselves with fuel and set themselves aflame to protest China's restrictive political and religious policies. A video posted online last year shows a Tibetan teenager lying on a street, his blackened body still smoking. Women scream and one repeats the name of Tibet's spiritual leader, the Dalai Lama. In part to mourn the loss of these people, hundreds staged public protests earlier this week. Saunders describes what happened when Tibetans gathered in a public square in Seda County on Tuesday. "Troops attempted to lock down the area. Troops fired at the Tibetans. It was a scene of terrible panic and fear," Saunders says. "At least one Tibetan was shot dead; others were shot. We heard from Tibetan sources that after this occurred, the square was covered in blood and there were tear gas canisters left on the scene." 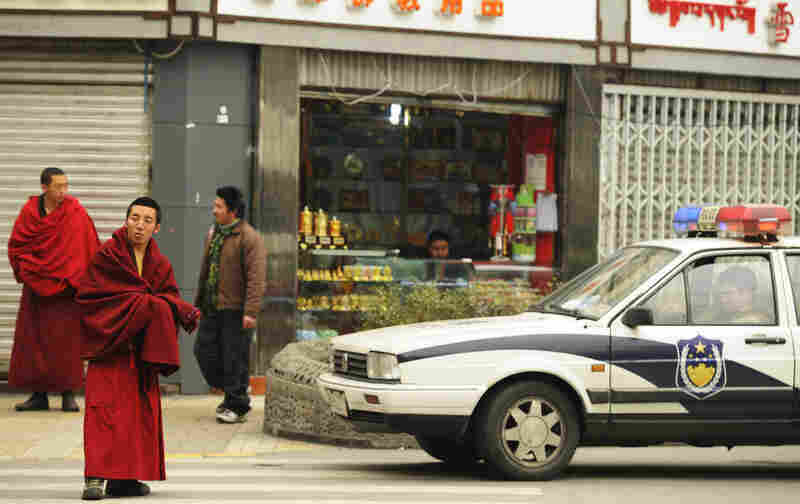 China's government insists Tibetans started the violence. Xinhua, the government's official news agency, says a Tibetan mob attacked a police station with "gasoline bottles," knives and stones. Xinhua said 14 police were injured. Confirming the facts is extremely difficult. Chinese security forces have blocked roads and prevented reporters from entering the region for months. NPR made 30 calls to hotels, restaurants and other businesses in the area with no answer — suggesting the government is blocking outside calls as well. Lobsang Sangay, the prime minister of Tibet's government-in-exile in India, says the self-immolations over the past year mark a distressing turn for the Tibetan freedom movement in China. "It's really sad. It's really tragic that Tibetans are resorting to such extreme measures," Sangay says. "Given the choice, anyone would like to live. No one wants to die." Robert Barnett, director of the modern Tibetan studies program at Columbia University, says Tibetans are desperate, particularly inside some monasteries and nunneries. Since 2000, China has imposed particularly harsh conditions on some Tibetan areas in Sichuan province, according to Barnett. He says those conditions include "attacks on the Dalai Lama personally, demanding monks denounce the Dalai Lama, so they've lost the support and patience of people in those areas." China's government blames the unrest and self-immolations on the Dalai Lama. The Communist Party says he encourages the suicides to foment rebellion — something the Dalai Lama has denied. Earlier this week, U.S. State Department spokeswoman Victoria Nuland criticized China's latest crackdown. "We have repeatedly urged the Chinese government to address its counterproductive policies in the Tibetan areas, which have created tensions and threatened the unique religious, cultural and linguistic identity of the Tibetan people," Nuland said. China shows no sign of changing its approach. Tibetan activists say the areas where the protests occurred remain under lockdown. Still, they say they expect more demonstrations in the coming days.